David Aquaticus: "Gwnewch y pethau bychain!" 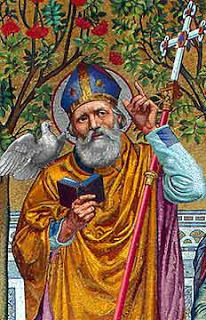 Today is the feast day of St. David of Wales, patron of Wales and poets, who is the only Welsh saint ever canonized. David’s nickname was “Aquaticus” which is Latin for “waterman” or “water drinker.” He acquired this nickname because he and the monks that followed him (he was an abbot and later bishop) drank only water. On top of that, he ate only one meal per day. St. David is frequently pictured with a dove on his shoulder while standing on a hill. Stories suggest that when preaching, a dove landed on his shoulder and lifted him up quite a ways so that his message could be heard by more people. You see, he was short. His name was suggested when they were deciding who the next archbishop of Wales would be, but the common complaint was: he’s too short and no one will be able to hear him. At that moment, apparently, the ground raised up where David was standing, and so he was selected. Good thing, too, because he had a good message to share about the role of joy in the Christian life. It’s necessary, he said. “Do the little things.” Good advice. St. David of Wales: Pray for us! Oh, Mike, he is special to me. I didn't know when I named our first little son, David, that there was another St. David. I was thinking of David of the Psalms. Anyway, on top of that, I'm am of Welsh decent! So, this is very fun to read..I'll go to the link and read more. Our David was very tiny too, but his life, although short, was very full! I like there being another St. David! Thanks and oh, btw…”Do the little things!” …that makes me think of the the Little Flower..she had similar thoughts! A very good humble and fasting saint for lent. Suzanne: From what I hear, your David was just as joyful as this St. David wised we all to be! What a blessing. Now he's really joyful with the rest of the Church Triumphant!